The 4th Annual Climate Adaptive Design Symposium is happening this week at The Collider. This year’s conference theme is “Deep Retrofit” – renovation of existing buildings to promote sustainable design. The two-day event begins on Thursday evening with a lecture that is free and open to the community. Friday’s conference is geared toward design and construction professionals. Six credit hours of professional development will be offered for Friday’s conference and one credit hour for Thursday’s lecture. Continuing education credits will be provided upon request. 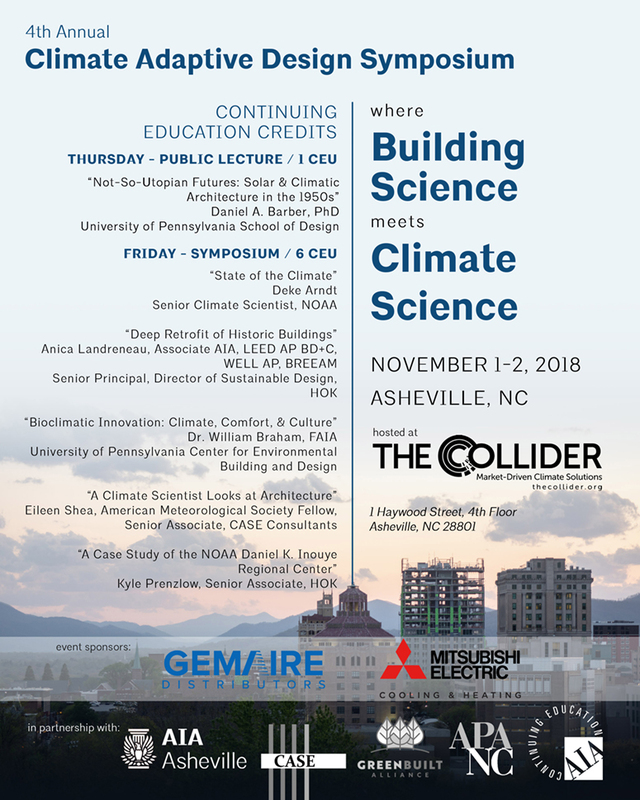 The conference is a collaboration between the AIA Asheville and CASE Consultants International. See below for a full schedule or find out more information and to register click here. The Friday conference is also held at The Collider with registration from 8:15 am to 8:45 am. The conference will conclude at 4:45 pm. A catered lunch is included in the registration fee.